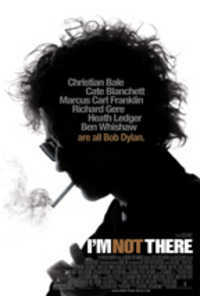 For those who complain, and usually rightly so, that most biopics fail inevitably at capturing the entire breadth of the person being celebrated, director Todd Haynes (Velvet Goldmine, Dottie Gets Spanked) has a possible solution in mind with his Bob Dylan experimental documentary, I’m Not There. And perhaps something for everyone, no matter what your taste in the music or the man. Do you have to have some idea about exactly who Bob Dylan is to connect to this multiple-personality mystery tour? Let’s just say, it helps. Enormously. And since Haynes is dissecting such a larger than life music legend, the feat may indeed require at least six actors to fill his shoes, or at least walk in them. Which is exactly what the filmmaker had in mind, recruiting for this movie that uniquely comes in a six-pack, a bunch of disparate actors of all sorts of shapes, sizes, ages, races and genders. So as to embody the enigmatic performer, who alternately enthralled and infuriated his fans while shaking up the music world during an equally explosive ’60s historical moment. Not that Haynes is so mesmerized by the Dylan mystique that he puts a cosmetic spin over all the problematic rough edges, as many biopics tend to do. Setting the record straight from the start, he emphatically tags the seeming countrified high plains drifter with a hillbilly twang, and of famously clouded origins – born Robert Allen Zimmerman and the son of a Jewish Minnesota shopkeeper – as poet, prophet, outlaw and, yes, fake. And the filmmaker’s disappointment in Dylan’s downward metamorphosis from political idealist to cynic, egotist, wasted stoner, Jesus freak and recluse, is palpable. You only have to check out the movie’s prelude, with Dylan’s corpse laid out symbolically at the morgue. It’s a lament, but for a body that has outlived its art. Love him or hate him, among the six Dylans – including Heath Ledger, Richard Gere, Ben Whishaw, Christian Bale, and Marcus Carl Franklin as an eleven year old black youth morphing into the singer’s main man idol, Woody Guthrie – it’s Cate Blanchett who miraculously takes center stage as his mid-1960’s scrawny, post-traumatic spectator-of-war syndrome afflicted incarnation. Manic, chain smoking and strung out on coke, this Dylan rants in telltale poet-speak, boos his fans, tells the media to go shove it, frolics with the Beatles, and sulks side by side with Allen Ginsberg as they commiserate with a statue of Jesus up on the cross.